[All photographs copyright, Gary Nunn 2016] – Today Sep 17, 2016 Matt Sadowski and I had just finished walking down to the southeast section of Fort Rosecrans National Cemetery when a moving shadow on the ground caught our attention. 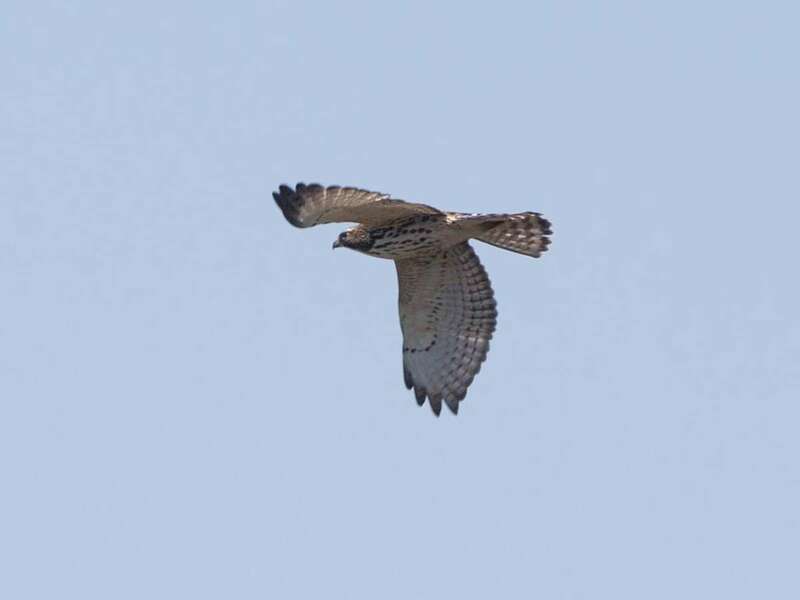 Sure enough, from behind the Norfolk Island Pine we were standing under, came a low-flying juvenile Broad-winged Hawk Buteo platypterus moving north along the Point Loma peninsula. This made all the tramping around in search of non-existent passerine migrants feel a little better! 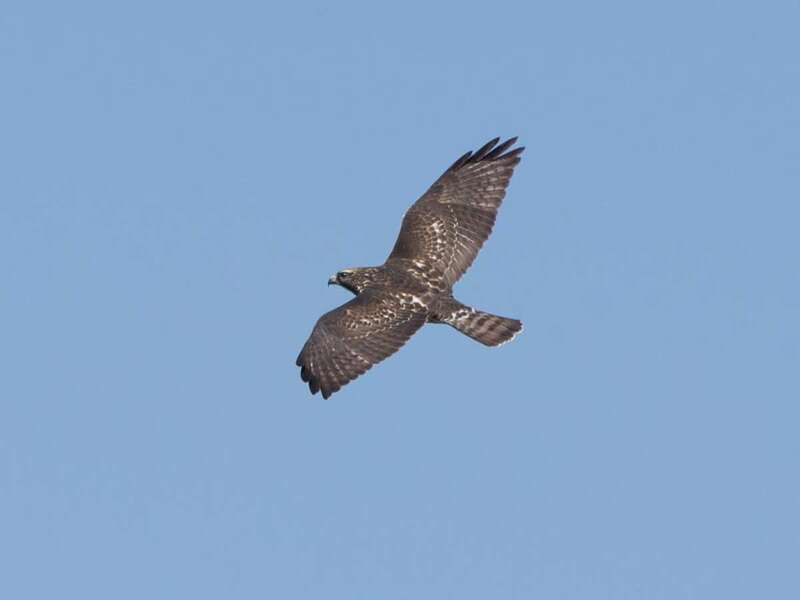 We had just watched a handful of migrating Sharp-shinned Hawks going south, so a nice addition to the raptors! It veered leeward and flew north up the east side of the peninsula disappearing from view. Then, less than an hour later, I was in the northeast section of the cemetery when a small flock of close Bushtits exploded in their harsh purring alarm calls. 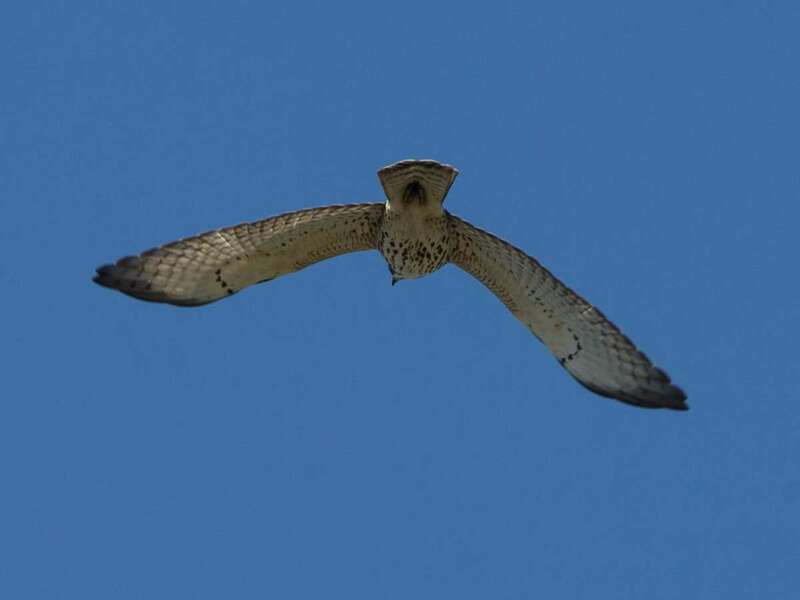 Back came the Broad-winged Hawk flying east-to-west across the cemetery affording some nice views of the upperside. 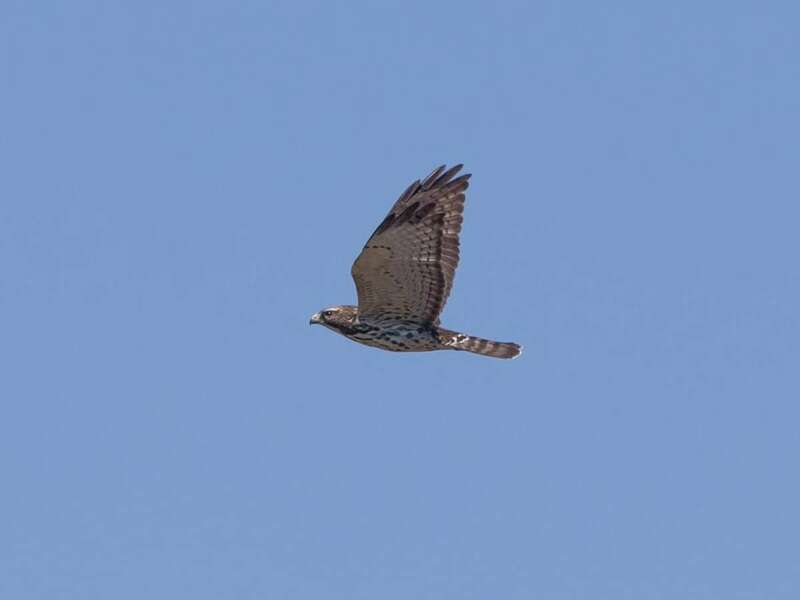 Broad-winged Hawks are about annual in San Diego and fall migration is the best time to try and see this species in the county. The Point Loma peninsula is a favored spot but sightings are somewhat random and fast moving birds can be easily missed. 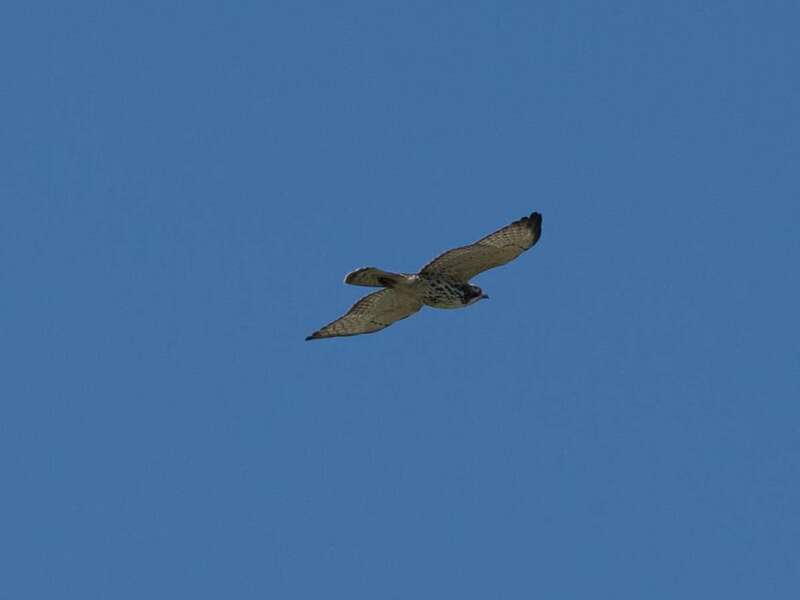 Broad-winged Hawks here tend to rocket south down the peninsula on the west side of the cemetery, presumably circle the far point, and then cut back north, against the crosswind, usually following the east or leeward side of the peninsula. Chances are also good that on this return northward up the peninsula they will cross the cemetery in low flight, and sometimes openly perch in a large tree, near to the administration buildings. If you see one going south wait around to see if it returns. The best time period for sightings seems to be around noon, 11am-1pm is a good window if you are waiting and watching. This entry was posted in San Diego County by Gary Nunn. Bookmark the permalink. There’s a Broad Wing Hawk currently hanging out in Fallbrook on my hill. I’ve seen him a few times recently. Last time I saw him pretty close, up in a palm tree in my yard watching me as I tended my chicken coop 3 days ago. Wish I’d had my camera. Hi, I just came across your site and love it! Your photos are wonderful! I was trying to search for San Diego gulls when I found some of your posts. I am not a bird expert but found a dead bird on the side of the road that looked like a gull to me. I took a couple of photos before laying its body to rest with a ceremony and would love to know what kind of bird it is. Could I please send the photos to you to see if you might be able to identify it? Sure please feel free to send me any photos of birds for identification.